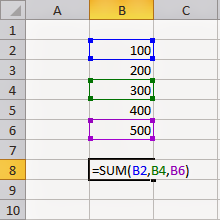 SUM is one of the most commonly used function in Excel , which is used to add the numbers in the argument. In this article you can learn the syntax and how to use excel SUM formula. You can use this formula to add the numbers in a range by selecting a range reference in the formula. You can also use select the cell references to add the required cells by separating the cell reference with comma( , ). You can include an array, a constant, a formula or the result from another function in the sum function. The shortcut key used to enter the sum formula is “Alt”+”=”, this will automatically enter the sum formula in the selected cell. 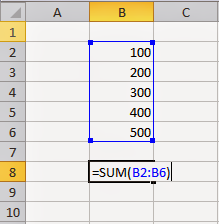 The sum function will ignore the empty cells, logical values and text in the selected cells. If any argument in the formula is error value, then the sum function will display an error.